JOINT BASE LEWIS-McCHORD, Wash. A caped figure captured on surveillance video came running out of the darkness to the edge of a remote Army outpost in southern Afghanistan. Blood was smeared on his face, prosecutors said, and soaked into his clothes. Less than a mile away, 16 Afghans, including nine children, were dead, some of their bodies on fire in two villages. As fellow soldiers stopped him at the base's gate, Staff Sgt. 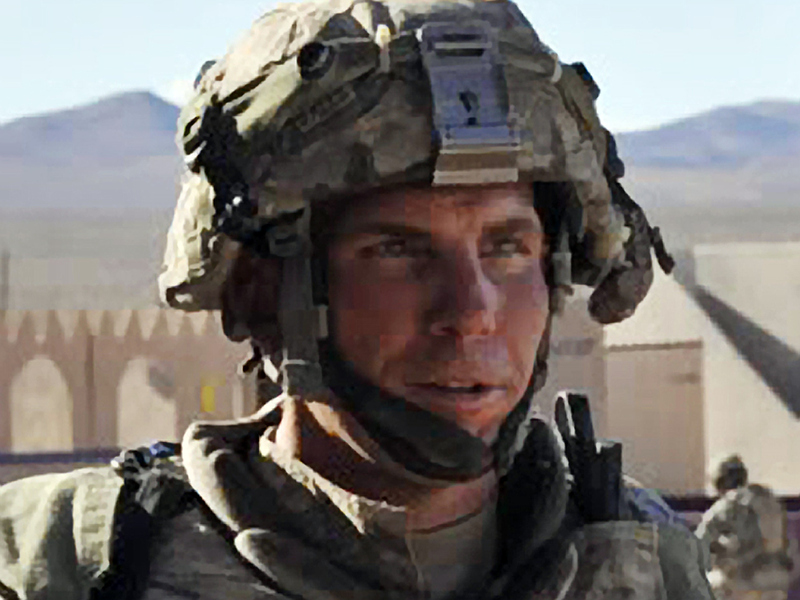 Robert Bales was incredulous, prosecutors said. Then, as he was taken into custody, Bales said: "I thought I was doing the right thing." The details, from a prosecutor as well as Bales' comrades, emerged Monday as a preliminary hearing in his case opened, offering the clearest picture yet of one of the worst atrocities of the Iraq and Afghanistan wars. Bales, 39, has been charged with 16 counts of premeditated murder and six counts of attempted murder in one of the worst atrocities of the Iraq and Afghanistan wars. The hearing will help determine whether the case goes to a court martial. Bales has not entered a plea. His attorneys have not discussed the evidence in the case, but say Bales has PTSD and suffered a concussive head injury during a prior deployment to Iraq. During the summer, Bales' wife, Karilyn, said on "CBS This Morning" that she believed her husband was innocent. "I truly believe that my husband did not do this," she said in the July interview. "I really just want the facts to come out through the fair trial." The father of two from Lake Tapps, Wash., sat beside one of his civilian lawyers, Emma Scanlan, in green fatigues as an investigating officer read the charges against Bales and informed him of his rights. Bales said, "Sir, yes, sir," when asked if he understood them. Morse said Bales seemed utterly normal in the hours before the March 11 killings. With his colleagues, Bales watched the movie "Man on Fire," a fictional account of a former CIA operative on a revenge rampage. Just before he left the base, Morse said, Bales told a Special Forces soldier that he was unhappy with his family life, and that the troops should have been quicker to retaliate for a roadside bomb attack that claimed one soldier's leg. "At all times he had a clear understanding of what he was doing and what he had done," said Morse, who described Bales as lucid, coherent and responsive. Bales is accused of slipping away from the remote outpost with an M-4 rifle outfitted with a grenade launcher to attack the villages of Balandi and Alkozai, in a dangerous district. American officials have said they believe Bales broke the slaughter into two episodes  walking first to one village, returning to the base and slipping away again to carry out the second attack. The prosecutor said Bales returned to the base at one point, telling a colleague about shooting people at a village. The soldier apparently took it as a bad joke and responded: "Quit messing around." Prosecutors played for the first time a video captured by a surveillance blimp that showed a caped figure running toward the base, then stopping and dropping his weapons as he's confronted. There is no audio. Morse said Bales was the caped figure. After being taken into custody, Morse said, Bales said: "I thought I was doing the right thing." The hearing is scheduled to run as long as two weeks, and part of it will be held overnight to allow video testimony from witnesses, including an estimated 10 to 15 Afghans, in Afghanistan. Bales' attorney, John Henry Browne, said the hearing will give the defense a chance to see what the government can prove. They are expecting a court martial. Bales is an Ohio native who joined the Army in late 2001  after the 9/11 attacks  as his career as a stockbroker imploded. An arbitrator entered a $1.5 million fraud judgment against him and his former company that went unpaid, and his attempt to start an investment firm in Florida also failed. He was serving his fourth combat tour after three stints in Iraq, and his arrest prompted a national discussion about the stresses posed by multiple deployments. Scanlan, his attorney, declined to say to what extent the lawyers hope to elicit testimony that could be used to support a mental-health defense. Bales himself will not make any statements because his lawyers said he would have nothing to gain. Karilyn Bales, who plans to attend the hearing, had complained about financial problems on her blog in the year before the killings, and noted Bales was disappointed at being passed over for a promotion. Browne described those stresses as garden-variety  nothing that would prompt such a massacre  and has also said, without elaborating, that Bales suffered a traumatic incident during his second Iraq tour that triggered "tremendous depression." Bales remembers little or nothing from the time of the attacks, the defense said. Scanlan, who deferred an opportunity to give an opening statement, said the Army had only recently turned over a preliminary DNA trace evidence report from the crime scenes, but defense experts have not had time to review it. Bales, who spent months in confinement at Fort Leavenworth, Kan., before being transferred to Lewis-McChord last month, is doing well, Scanlan said. "He's getting prepared," she said, "but it's nerve-wracking for anybody."